Without question, Tropical Storm Irene was the story of 2011, almost eclipsing memory of any events that occurred during the eight preceding months of the year. Individual artists, as well as arts organizations and venues, were among those affected by the flooding that Irene wrought. All have their stories, which we’re likely to be retelling and updating for months and years to come. In this, the last issue of Seven Days in 2011, we check in with two of them. On the day after Irene struck Vermont, Queen Elizabeth was a mess — covered with muck from toes to crown. So were all the other costumes in the White River Junction storage room of Revels North, a performing arts group that presents solstice-centric pageants in medieval, Renaissance and Victorian traditions. Though based in Hanover, N.H., the Revels had been storing 35 years’ worth of costumes and stage props just across the White River in a Bridge Street facility for the past few years. The space also housed a center for theater craft, shared with other companies in the area, which taught costume and set construction. On August 28, the storm and the river took top billing in an unexpected, historic drama of their own making. Lois Jackson, who created the Elizabethan costumes, notes that they are particularly heavy — “lots of tapestry, upholstery, velvety, rich-looking fabrics,” she says. They were even weightier saturated with water and mud. Nonetheless, as happened in so many hard-hit communities around the state, everyone rolled up their sleeves, pulled on their boots and got to work. A team of “Revels responders” showed up almost immediately to pluck costumes out of the mud, assess their condition and take whatever steps were needed to salvage them. The volunteers comprised not only staff and friends of the group but community members who read about the Revels’ plight in the local Valley News. And clean them they did: “We power-washed them to get all the mud off,” Jackson recounts. Then they filled huge storage tubs with water and dunked the costumes in successive ones until they came out clean. 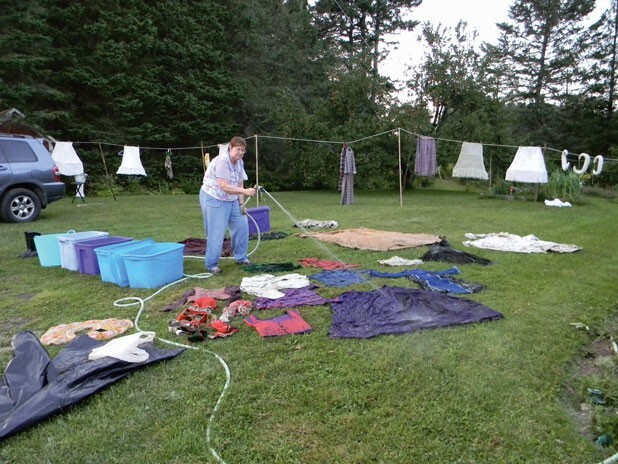 Finally, volunteers spread out all the clothes on the lawn, or hung them on clotheslines, to dry. But then the Christmas miracles began, a little early this year. News of the Revels’ situation quickly spread beyond the Upper Valley. The group operates under the umbrella of Revels, Inc., which is based in Cambridge, Mass. Both Revels organizations were founded by Carol Langstaff of Sharon, Vt. — her late father, John, launched the first one in 1971. There are eight “sister” Revels groups around the country. And they began to send donations — both costumes and money. The group’s fundraising effort is called the Revels North Flood Recovery Fund Appeal. Board members and Revels performers pledged $10,000 to match the first 10 grand that came in from the general public. As for their space, both Dartmouth College and a business in Lebanon, N.H., offered temporary quarters to the Revels in which the players could begin to reorganize and prepare for December’s performance — based on a tale in which Elizabeth I travels to a manor house outside London and is roundly entertained by the villagers. Presented over four nights just before the winter solstice, it was a particularly poignant triumph for the revelers, on stage and off. And the queen looked just as regal as ever. Last September, when we were able to phone gallerist Anni Mackay after Tropical Storm Irene, we didn’t talk about art; she was uttering phrases such as “stages of crisis” and “how to maximize the manpower,” and conceded that things in her tiny town of Rochester were “a little terrifying.” Irene and the flooding that ensued hit Rochester like a grenade, destroying all the roads, taking out the electrical power and completely isolating the village for days. Mackay’s BigTown Gallery on Main Street was spared, but she described it as “an island, pretty much, with water on three sides of us.” When two nearby houses collapsed and fell into the river, “It diverted the water around us,” she explained. That relative good fortune freed Mackay and her husband, town selectboard member and Green Mountain Bikes owner Doon Hinderyckx, to help others. Sounding a bit shell-shocked, she told us how she had taken on “the responsibility of medical needs” for her town. Remarkably, four local residents were on dialysis, one required insulin and a few needed antidepressants. “It took about 72 hours to coordinate all that with various health facilities,” Mackay said. “We had a liver-transplant failure, a blood transfusion, things like that.” She called in helicopters from Dartmouth-Hitchcock Medical Center. As if Irene weren’t traumatic enough. To that end, she curated three simultaneous holiday exhibits: bronze sculptures, and a few prints, by Middlebury artist David Bumbeck; photographs of Irene’s devastation in the area by John and Kate Penwarden of Mount Holly, Vt.; and a group show of petite works, priced under $1000, by notable regional artists whom Mackay has previously shown at the gallery. Titled “The Small Great Art Wall,” the selection features pieces under 20 inches square by the likes of Ben Frank Moss, Bunny Harvey, Edward Koren and Henry Isaacs.